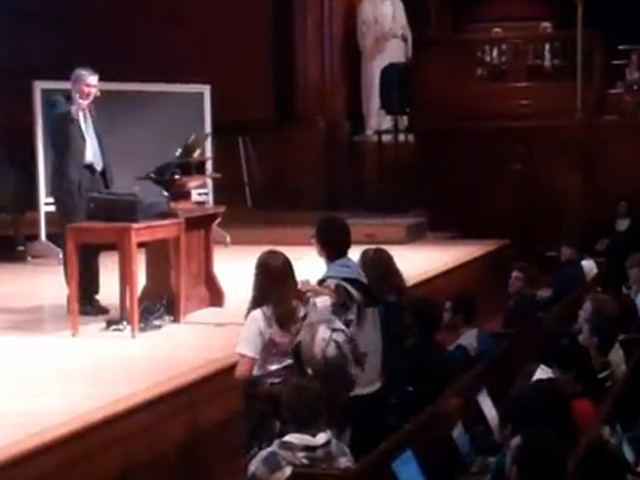 Earlier this month, 70 students walked out of Gregory Mankiw’s principles of economics class. In response to the walkout, the Institute for New Economic Thinking has launched the the syllabus project 30 Ways to Teach Economics. something is shifting out there, and we ignore it at our peril. It would be very easy to dismiss the student walk-out as an exercise in intellectual laziness and grandstanding. (After all, as many have pointed out, Keynesian models can’t be taught until second semester of Harvard Ec10.) But perceptive instructors know that sometimes a stupid question is more than a stupid question. And a really perceptive instructor will take a seemingly stupid question and turn it into the insightful question that the student should have asked. . . So schedule a teach-in before your classroom is occupied. Among the alternative approaches to the principles of economics, Stephen Ziliak offers one of the more interesting: teaching The Grapes of Wrath. I guess my first response is that I eschewed in my own research the one-voiced, monological approach of conventional neoclassical economics. Trained as an economic historian, I’m an amateur poet who had also worked as a welfare and food stamp caseworker in the county welfare department, going door-to-door in the poorest neighborhoods of Indianapolis. When I became an Assistant Professor of Economics, in 1996, I was searching for a teaching method that would open up the conversation to a wider, more realistic set of issues. It only seemed fair to me: given that I myself had philosophical objections to the conventional approach to teaching utilitarian economics, it hardly seemed right to force-feed my students. Plus, many of my students came from working class families but they’d never experienced a recession. I wanted them to know that growth and bubbles do not last forever. My own approach is somewhat different (my various syllabi are available here). For almost 30 years, I have focused on teaching neoclassical economic theory, which I present both as one story about the economy among many and as the hegemonic story among economists inside and outside the academy. I start with economic history and then present neoclassical theory from its basic assumptions (such as the assumptions about human nature) through its most important theoretical conclusions and policy recommendations (such as general equilibrium and Pareto efficiency). Then, after I present some of the extensions of neoclassical theory (such as imperfect competition, game theory, and international trade), I discuss some of the basic criticisms of neoclassical theory (from the endogeneity of preferences through the concept of capital to the distribution of income), a couple of lectures on Marxian economic theory, and the consequences for theory and policy of the differences among economic theories. There has never been a walkout from my principles of microeconomics class. “We” others aren’t either. Well said, David. I emphatically agree that teaching the mainstream approach is essential, because no-one can argue effectively against a view that they don’t fully understand. But teaching the mainstream view is, as you know, only the first step. Many of us who have been teaching “both sides” for years (when the other side only sees itself in the mirror) share your approach. It is sweet to be able, right now, to refer to the news media (for a change) when presenting alternatives to conventional wisdom. Let’s all work to help students learn more about the history of economic thought, and insist that a little more that knowing where we’ve been matters to where we are going.